Shiraz by Baileys Glenrowan of Glenrowan. Rich and ripe flavours of bramble and blackberry and liquorice, a soft mouth warming mid palate tending to sweet fruit flavours of chocolate, supported by rich and round velvety tannins. Richard Bailey planted one of the first Glenrowan vineyards in the 1860s. Baileys of Glenrowan are amongst the earliest pioneers of Victorian viticulture, inaugurally vintaged in 1870, internationally renowned for their intensely flavoured and richly structured wines. The succulent red wine of choice to accompany the finest beef wellington or wagyu sirloin. The Baileys set up a store in Glenrowan to supply miners on nearby goldfields. This store was located alongside the famous Anne Jones Inn where the Kelly gang siege was to take place. As the gold fields dried up and the miners moved on, the Bailey family turned to farming instead, settling their property near Glenrowan. Back then, rural life was tough and lonely, and the Glenrowan countryside was barren and unforgiving. But the Baileys family persevered on their property named “Bundarra”: eventually planting one of the district’s first vineyards. In 1870, Richard and his son Varley proudly produced their first vintage. It was gold of a very different hue, but gold nevertheless, and the birth of an Australian legend! The Bailey property remained a winemaking success from then on: with the winemaking mantle passed on from father to son through the generations. During that time, the region was terrorised by the infamous bushranger Ned Kelly, who was finally captured in 1880 at Glenrowan - just a short gallop from Baileys. Far more terrifying than Ned though, was the outbreak in 1890’s of Phylloxera. Whilst only tiny, the parasitic pest Phylloxera devastated Victoria’s early wine industry. Many vineyards were ordered to destroy their vines, and many heartbroken winemakers simply walked off their ravaged land, never to return. But once the Phylloxera scourge had passed, the Baileys family replanted in 1904 on Phylloxera resistant root-stock -- and soon the family’s famous red wine flowed again. 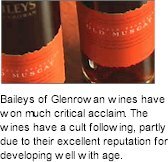 The Baileys of Glenrowan Shiraz, full of flavour, quickly built a reputation and a loyal following. Further plantings of Shiraz, Muscat and Tokay took place in the 1920's. 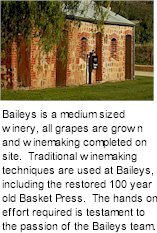 Recent improvements to the Baileys of Glenrowan site have ensured the success of the winery for generations to come. Plantings throughout the 1950’s to the 1990’s have seen the vineyards increase to 143 hectares, with an annual crush of 1600 -1800 tonnes. The historic Glenrowan wine region is renowned for its luscious fortified wines and rich red wine styles, a product of the area's deep, red granite soils. The region is bordered by the Ovens River to the north and the Hume Freeway to the south. Most cellar doors and vineyards in the region are located close to the historic township of Glenrowan, on land that lies between the Warby Ranges and Lake Mokoan. The region's oldest vineyard is Baileys of Glenrowan. Tradition is important at Baileys, with many heritage buildings and historic artefacts on display - providing a real glimpse into Australia's colourful rural past. Apart from its intensely flavoured wines, the Glenrowan area also produces a range of stone fruit - such as juicy nectarines, peaches and cherries - plus deliciously sweet strawberries. New, state-of-the art winemaking equipment was built at Baileys in 1998. At the same time, the 100 year-old basket press was restored to ensure that the tradition lives on in all of Bailey's wines. The restoration and upgrade of the winery cellar door in 2000 completed the recent improvements and enabled the sharing of heritage and the full Baileys experience with the winery's visitors. Today the Baileys winery is a boutique operation that showcases the best of both worlds, with modern winemaking facilities complimented by traditional techniques and very old vines. The internationally sought after wines however, are not the only attraction at Baileys of Glenrowan. The original Baileys family settlers were inspired in their choice of location, for as well as the perfect vine-growing terroir, the Baileys vineyards are situated in a beautiful area. When arriving at Baileys, visitors meander beyond an original blacksmith forge, through a peppercorn avenue, past long-standing stone Clydesdale stables and the original block of Shiraz planted in 1904. The end of this picturesque track opens to landscaped grounds, where a traditional welcome awaits you in the 100 year-old cellar door.